This printer is a trooper. She kept going and going through the struggle. It looks like I have a partial clogged extruder assembly. Thoughts? I have never cleaned one before so I'm hoping I don't have to tear this whole HE280 apart to fix it. 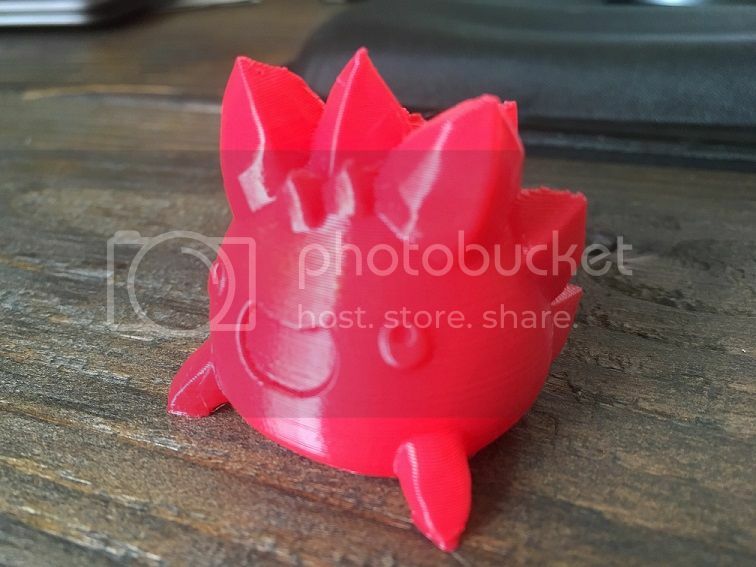 It continued to print in a "failed" status, looks real bad and patchy. I cancelled the print and tried to remove the filament. It came off right at the end of the bowden tube when I pulled the retention clip off. Not sure how much is still inside. Start with that extruder. 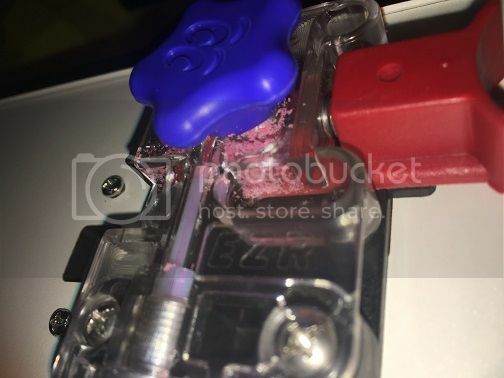 You will probably need to remove it and pen it p to clean all that ground filament out. That is probably your issue, the other end (the hot end) is probably just fine. PS 3D printing is not a hobby, it's a lifestyle! That would be great if its just the EZR. Would a bad setting cause this? Like the EZR is trying to put too much filament through the nozzle that cant handle it? It could have been caused by a lot of things. How much experience do you have? Have you had 1 reasonably good print? If so, your slicer settings are likely fine. What were you tweaking? That's the place to start. I have had amazing prints ever since I switched to SD card printing (like I have always done on other printers). Mattercontrol from my junky laptop caused pausing/blobs/zits so I still use it to slice and save gcode to SD- so much better. Stringing has always been an issue so I changed retraction settings a bit and got a decent looking slime rancher. My mistake was trying to speed this rig up I think. I was hoping for something faster than a snails-pace and then let it rip. Stringing came back and the EZR jammed all up. I decided to try the bandaid gcode so there was no possibility of me messing it up. 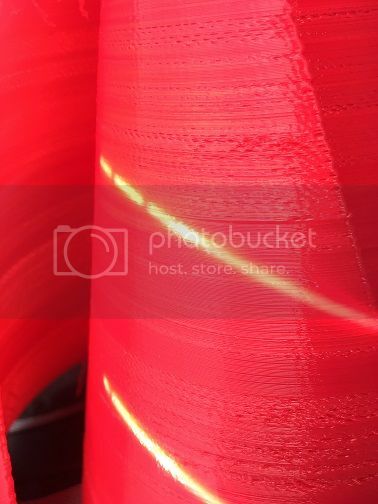 After cleaning out all the red PLA fragments from the PTFE and the EZR I gave it a try. It printed OK. 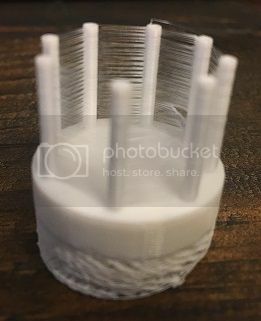 The results are not any where near as nice as Michael's in that the corners are doo-doo and the top layers seem not enough, but it was a successful print. I then decided to throw a Benchy at it using the KISSlicer and Michael's profile I imported......once again, trying to not make a problem when it is MY doing..... So I sliced and began to print. Came back after a bit to discover the EZR is now starting to have fresh white dust all inside it, and the motor gear is 1/2 gummed up just like the red PLA did (ended up canceling part way through). I could see it trying to print, but it was struggling.......what else could I look into next to see why it does this? Can you feed through the boden and hot end by hand (holding the release and pushing). Yes, sometimes it is clicking. I can see the motor running and not pushing filament. On the Benchy. On the bandaid, it worked no problem that is why Im lost. 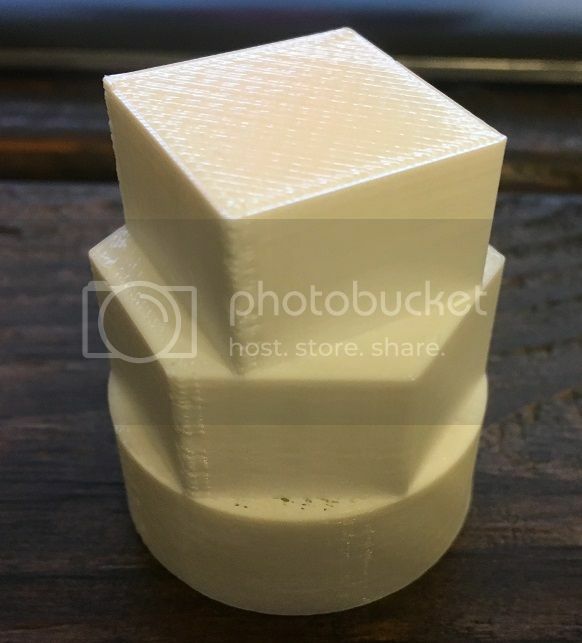 Have you checked that the extruder's gear is aligned with the filament? Then slow down to 25/s and see what happens. Retraction setting changes can cause the issues you are describing. I made changes to my my V3 and lost track of what I changed so I went to MatterHacker and added my printer again with a new name and that will load all the default settings so you can at least start from a known starting point. Orbot Hadron running and E3d 6, Smoothie on an Azteeg Mini, LCD, fully adjustable glass bed of my design with a silicone mat heater. The official name for this printer is Britney Spears, or Britney for short, because oops, She did it again. I decided to start fresh as mentioned above. While I was at it, I did check the alignment of the filament and the gearing and it looks good. 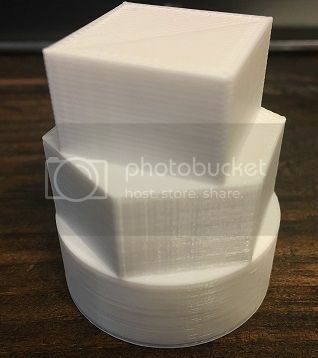 I re-printed the bandaid using Cura as the slicer of choice with Michael's settings and it came out almost perfect; even better than the Kisslicer one did. The first layer had a few issues, as you can see from the picture, but eventually worked itself out. Thanks for the link to check. Ill go back and look again, but I'm pretty sure the gear was normal at last glance. Did you ever sort out your extruder grinding and chewing up filament into pixie dust? My V3 just started doing it out of nowhere, and I haven't changed anything settings wise. Curious if you nailed the fix down. Thanks. Scratch that last post and thanks for that link! I just checked my hobbed bolt and its machined goofy, almost smooth. This is my first run of PETG through so I guess the greater softness than PLA is making it lose traction. Time to take pics and submit a ticket for replacement.